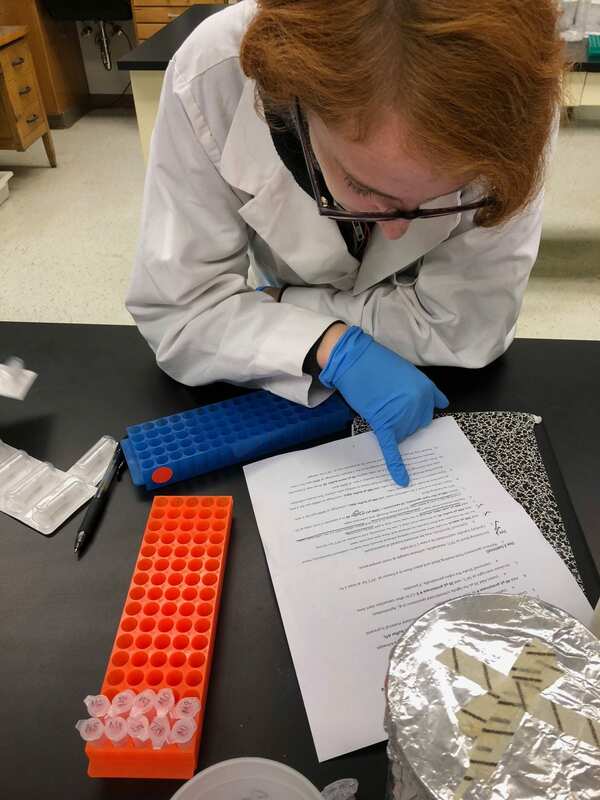 Continuing on with my undergraduate research project on the firefly genus Pyropyga, the next big step was to use of DNA barcode to identify the morphospecies we separated visually. The process of extracting and amplifying DNA is both lengthy and complicated; full of many steps and countless hours. Before I worked on this project I only knew the basic theories and steps behind the process. Anything I might have learned through the many biology classes I have taken over the years. But there is a substantial difference between learning about DNA extraction and amplification and actually doing it. 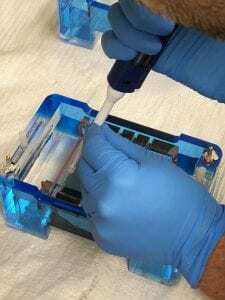 So when I sat down and thought about what I would write for my next blog post, I decided I wanted to explain each step I took in a way that you, the reader, could understand regardless of any background knowledge you may have regarding DNA work. Writing out the procedure also greatly helped me grasp the ins and outs of extracting and amplifying DNA that I had already accomplished. Throughout the process I followed the steps for DNA extraction and PCR protocol from a handout provided to me and, in truth, there are many steps I performed without fully grasping what they accomplished. But through the process of writing out and explaining each step I took, I now feel that I have a better knowledge of what I did and why I did it. So without further ado, here is the entire DNA extraction and PCR amplification process in my own words. The first step in the process is to acquire the sample from which you will be extracting DNA. Our sample was a leg from each specimen. The process of removing a leg (we used the back left leg) from the specimen was a bit difficult on account of just how small members of the genus Pyropyga are. What I did in order to solve this was to use two pairs of very sharp forceps, one to hold the insect, and one to pull the leg off. The second step is to isolate the DNA from the leg. To do this the leg is added into a solution of buffer ATL which breaks down and opens the membranes of the cells so that the DNA (in the form of nucleic acids) can be removed and suspended in solution. 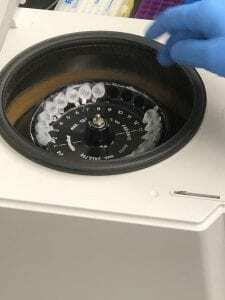 A small amount of proteinase K is also added to the solution in order to digest and remove proteins that could otherwise contaminate the DNA sample while leaving the DNA intact. This solution is incubated overnight at 56°C to aid in the process. After the specimens are done incubating they are removed from the heat source and placed in a freezer for at least two hours. The third step of the process is to eliminate cellular debris and purify the DNA. The vials containing the legs in solution (called a supernatant) are removed from the freezer and allowed to thaw. The previous step should have successfully pulled DNA from the leg and left it suspended within the supernatant, so we can now remove the legs from there and put them back with their respective specimens. The goal now is to use a special vial called a DNAeasy column which contains a membrane that collects the DNA through the next steps. First a solution of Buffer AL (that’s a protein precipitation solution) is added. When the DNeasy column is sent through a centrifuge with the solution in it, the DNA will be attracted to and will stick to the membrane of the column and all other particulates and materials should pass through. This membrane is then washed to further clean and purify the DNA using buffer solutions AW1 and AW2. Once the DNA within the membrane has been washed successfully the fourth step of the process begins, the elution of the DNA. “Elution is the process of extracting one material from another by washing with a solvent, in this case extracting the DNA from the membrane” as pulled from dictionary.com. In order to accomplish this, Buffer AE is added to the DNAeasy column before the column is centrifuged. This serves to pull both the elution buffer and the DNA through the matrix membrane allowing the membrane to be discarded and leaving behind a vial full of DNA in solution. DNeasy column with DNA in solution at the bottom! From there the DNA solution is ready to undergo PCR, short for Polymerase Chain Reaction. This method is used to amplify and duplicate a strand of DNA making it easier to sequence. 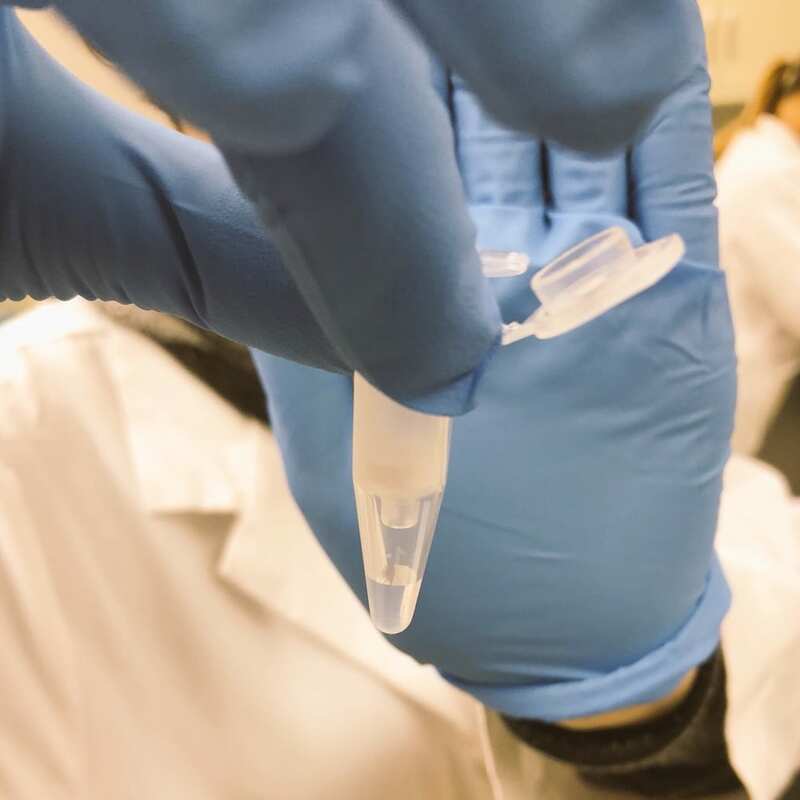 The first step of the PCR process is to create a master mix solution using a base of Green Master Mix which contains Taq polymerase, dNTP, MgCl2, and reaction buffers already mixed into the optimal proportions for DNA amplification (1). To that base, equal amounts of forward and reverse primers are added. These primers will serve to bind to the DNA strands later in the PCR process. Finally, water is added so that the primers and the water equal the same amount as the Green Master Mix solution and a small amount of DNA is added before the tubes are centrifuged. Once that is finished the vials containing the DNA are put into the PCR machine and set to begin the cycles. PCR itself contains three major steps: 1) denaturing, where the DNA solution is heated up to a very high temperature in order to essentially ‘melt’ the bonds between the double stranded DNA to make it single stranded, 2) annealing, where the DNA solution is heated to a much lower temperature than the denaturing step which allows the forward and reverse primers in the solution to bond to the appropriate ends of the DNA strand, and 3) extension, where the DNA solution is heated to a temperature between the first and second steps to allow the taq polymerase in the solution to extend the DNA strands. These steps are repeated several times (upwards of 25) before the PCR is complete. By now the DNA should be sufficiently amplified and ready to send off to be sequenced. But how do we know for sure? PCR can fail for a number of reasons resulting in unsuccessful amplification that cannot be sequenced properly. The determination of the success of the PCR process is done with a different process known as Gel Electrophoresis. 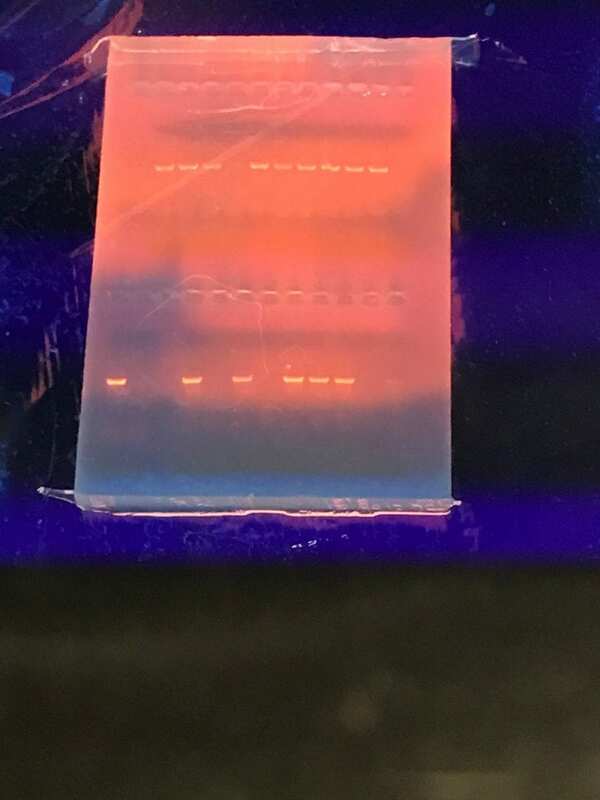 Gel electrophoresis allows us 1) to see if we successfully amplified the DNA through PCR and 2) to ensure that only one product was amplified. 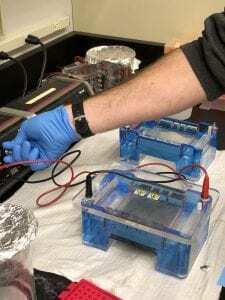 The first step of the process is to make the gel in an apparatus that will later allow for an electric current to be sent through the gel. After the gel is made a buffer is added to completely submerge the gel which allows for the electrical charge to flow. 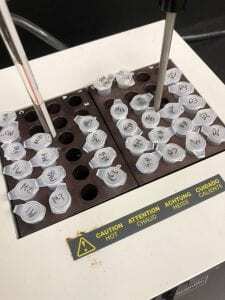 Then, each sample of DNA is carefully pipetted into the individual wells in the gel, and anodes and cathodes are attached to the apparatus and turned on before letting the system run. 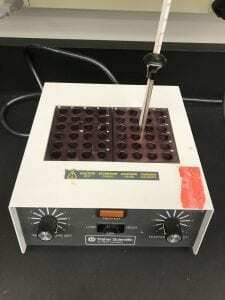 Once the system is done running the gel is removed from the apparatus and placed within a chamber and illuminated with a black light. If the PCR process was a success a bar of light should be visible below the well. 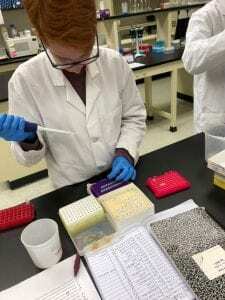 If there wasn’t an illuminated bar or if there are more than one bar per column, then the process was unsuccessful or the DNA was contaminated and the PCR must be redone. If everything looked good then the samples are ready to be sent off to have the DNA barcoded! Note the single bright orange lines on the gel. Those mean that the DNA amplification was a success! Thanks to Zach Lahey, PhD candidate in the Johnson Systematics Lab at Ohio State for his guidance in the molecular lab. About the Author: Martha Drake is fourth-year undergraduate majoring in Entomology and minoring in Environmental Science at Ohio State. She has a special interest in Coleoptera. After college, she plans on attending graduate school and hopes to eventually work in research or in the curation of insect specimens. Martha joined the Triplehorn Insect Collection in September 2015. Unless otherwise specified, all pictures by L. Musetti.